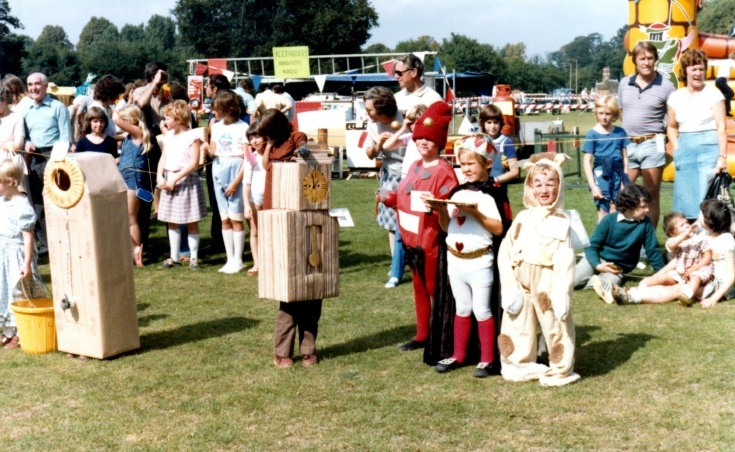 There are three photographs in this set taken at a fete in the Recreation Ground in Handcross. Two are included here; the third can be found at picture #2462. Please can anyone supply more information or identities? The Large Version shows a close up. Click on the picture to zoom in. Select Open Document to view another picture of the fancy dress competition. The sign indicates that this section is for those aged 1 to 4. Wearing a red dress is Joan Greenfield. The document also includes the programme for the Handcross Flower Show and Fete held on 20th July 1985. Sarah and Clare Mellish are marked in the left, Colin and Nicola Miles are there plus Dawn Sired, daughter of Tim Sired. Keren Matthews was the younger daughter of Noel and Derry from the hardware shop. Not sure if that is Lynne Ansell on the right in a blue skirt.